We have arranged for Dannie Street to teach a Ladies Styling class on 1 November. Danie is a Professional Dancer, Teacher and Choreographer specialising in Salsa and Latin dance performance. Danie completed a BA in Dance Development, is UKA Qualified and Insured and CRB checked. Danie teaches evening Salsa classes and children’s after school clubs in Street dance and Cheerleading. She has just arrived back on the Island after six weeks dancing and training with the world’s top salsa teachers in New York. The class will be at The Heights Leisure Center on 1 November, between 10:00am and 12:00pm, the cost for the class will be £10 payable in advance to any Isle of Wight Salsa Committee member. This really is fantastic value, and if you speak to anyone who has attended a styling class before they will tell you how they have benefited from them. If you would like to attend, or know anyone who would, then please do get in touch. Lots of positive feedback received about the first night at our new venue, The Marine Bar & Diner on Ryde Esplanade. It was busier than it looks in this photo. On 13 October 2015 we will change venues. 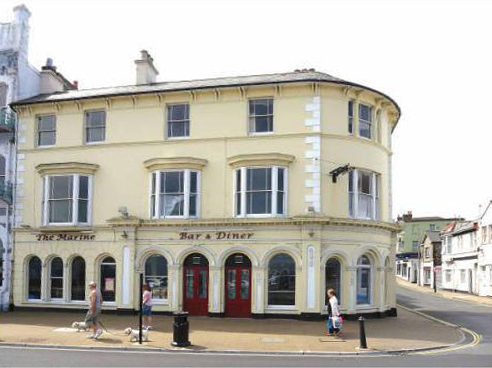 We will be moving to the Marine Bar & Diner, Esplanade, Ryde, PO33 2DZ.